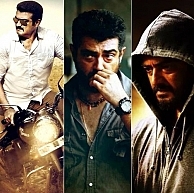 The latest update from the Yennai Arindhaal camp is here. The shoot of the climax chase sequence is currently being done in candid mode (guerrilla film-making) in some busy roads of Chennai, without the knowledge of the public. This is taking some time and the last day of shoots hasn't been decided yet. The shoots of all the songs have been done and recently, a fight sequence was canned in Binny Mills in Meenambakkam, Chennai. A solo song with Trisha was also completed. The film is well and truly in its last and final leg of shoots! A medieval poet for Vai Raja Vai! Kakki Sattai wants to be part of the race? Aishwarya Rai is BACK ! Lingaa will not stop the Pisaasu ! Will 'I' be a special hat-trick for Chiyaan Vikram? 'Thala 55' Intro Song Will Become A Sensation! What Sort Of An Intro Song Will 'Thala 55' Have? People looking for online information on Ajith, Ajith Kumar, Thala 55, Yennai Arindhaal will find this news story useful.